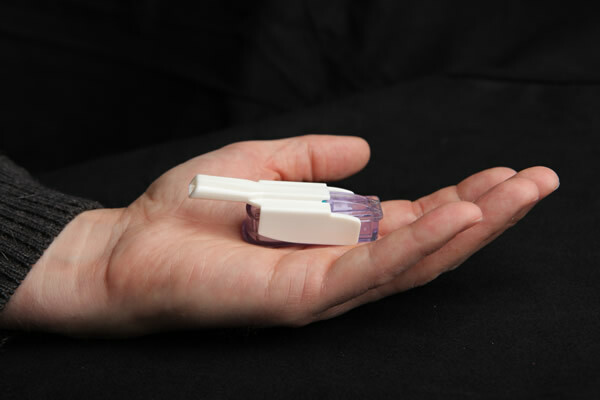 Following the terminated partnership with Sanofi, MannKind has relaunched its ultra-rapid-acting inhaled (needle free) mealtime insulin, Afrezza. diaTribe is very enthusiastic about Afrezza’s potential for people with diabetes in need of alternatives to traditional insulin and hope very much that patients will be able to obtain access. 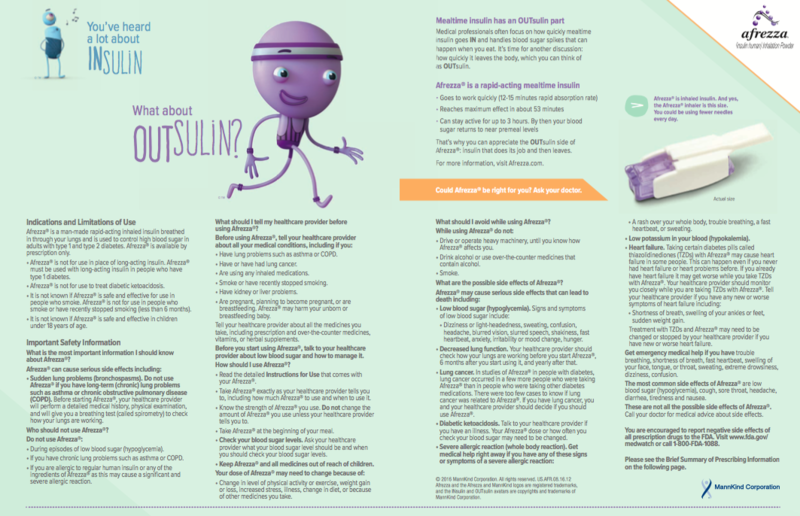 As diaTribe has previously covered, Afrezza is an ultra-rapid-acting insulin for people with type 1 and 2 diabetes, peaking in only 16-21 minutes versus about 60-90 minutes for current injected rapid-acting insulins such as Humalog and Novolog – that’s a big difference! Recent studies of Afrezza also showed that it lasts two-to-three hours less than other rapid-acting insulins. This is an important advantage for a mealtime insulin – fast-in, fast-out ensures the insulin covers food quickly, without lingering and causing delayed low blood sugar. 1. A new Afrezza Patient Savings Card and Reimbursement Program. Sign up is available online or in a doctor’s office and could reduce cost to as low as $15 per month for those with a commercial insurance plan (not available for Medicaid, Medicare, or certain state-funded plans). Signing up for the reimbursement support program also confers enrollment in a customized patient adherence program, helping users take Afrezza regularly with meals to maximize its benefit. 2. A new starter pack. Though Afrezza was previously available in four-, eight-, and 12-unit cartridges, MannKind has now released a 30-day titration pack combining 90 four-unit cartridges and 90 eight-unit cartridges – giving users greater flexibility to adjust their dose as they learn how to use Afrezza. This also allows patients more customization options in adjusting their follow-up (“correction”) doses of Afrezza if they aren’t at their glucose goal after a meal. Titration is especially important during the first 30 days, as the dose response to Afrezza is different than injectable insulin. 3. More education and improved labeling. MannKind’s initiatives in education include a bureau of voluntary speakers who will educate healthcare providers on how to best prescribe Afrezza. The company also plans to update its product label to reflect how quickly Afrezza works and how to change doses effectively. For more on Afrezza, check out previous diaTribe coverage on interviews with users after the product’s first launch. There has been terrific feedback but very tough challenges regarding coverage – we hope to see this change for the better. Particularly given how poorly people with diabetes have been doing overall with insulin, diaTribe is hopeful about this important new alternative.